Cartoonist Andrew Birch (Private Eye, The Oldie, numerous broadsheets) extends his paintbrush to join the quill of Atters Attree in their own project titled Bachelor Cad. This earlier prototype was a “work in progress”. Atters Attree’s Paranormal Terrors show will be performed at the British Fantasy Societies Fantasycon, 2012 on Saturday, September 29th (10.25pm). Other Fantasycon guests billed include Mark Gatiss (League of Gentleman, Dr Who, etc), Robin Hardy (original director of the 1972 film The Wicker Man), horror authors James Herbert, Brent weeks, Joe R. Lansdale and many more names from the world of fantasy themed media and publishing. 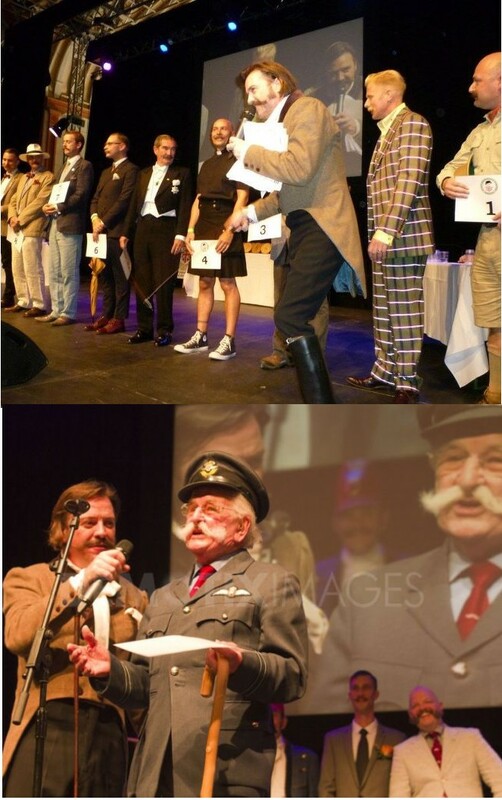 Atters Attree (world championships compere veteran) plays host to the British hirsute and “one of the few” – WWII veteran spitfire pilot Geoff White (clad in his original RAF officers jacket) at the first ever British Beard & Moustache Championships (September 2012). Atters Attree’s 2012 Chap interview with Adam Ant (part 1) published in Issue 60 of The Chap magazine. Chap Editor Gustav Temple & Resident Bounder Atters Attree in two ITN “vintage film” productions.